The global market for aroma chemicals is highly competitive as the number of manufacturers present in this market is limited and all the players have to significant shares in terms of revenue. The global leaders dominate the market and hold strong positions in their specific product segments. Although the aroma chemical market offers substantial growth potential, yet the need of heavy investments for the enhancements of aroma chemicals acts as a barrier to new entrants. In order to survive the intense competition, some of the key players are adopting strategies which include product development, extensive research and development activities, strategic pricing, and product differentiation. These factors will improve their position in the market and increase customer base. Also, some vendors have started establishing partnerships with other firms, resulting into market consolidation. Some of the prominent players in this market incorporate Givaudan, Takasago International Corporation, Solvay, IFF, Sensient Flavors & Fragrance, Firmenich SA, Frutarom, Symrise, BASF SE, Robertet SA., and KAO CORP. In 2015, the global aroma chemicals market was valued at US$3.85 billion and is estimated to reach US$6.57 billion by 2024. The global market is anticipated to exhibit a strong CAGR of 6.2% during the forecast period. On the basis of type, the natural aroma chemical segment is expected to remain unchallenged from 2016 to 2024. According to product, benzenoids segment is anticipated to witness a promising market share in the next coming years. Based on region, Europe is projected to dominate the aroma chemicals market in the coming years. The Middle East and Africa is also likely to witness steady growth in this market within the forecast period. One of the primary factors responsible for the growth of aroma chemicals market is growing number of end-use industries. Other factors which include rising demand for healthy lifestyles, growing disposable salaries, and rising preference on the usage of natural products have recently witnessed a spurring growth of several markets which include perfume industry, household products, food & beverages, and personal care industry. The aroma chemical market is driving demand for customized fragrances on the account of increasing consumer awareness with respect to grooming and personal hygiene. Consumers now are ready to spend more on personal grooming, this coupled with awareness is expected to offer huge growth opportunities for the market players in the forecast period. In addition to this, rising population is also going to increase demand for household goods such as candles, incense sticks, and cleaning products are substantially boosting the demand for aroma chemical market in the forecast period. Looking at the downsides of the aroma chemical market, there are few factors which are expected to impact the global market in the coming years. Strict government regulations forcing companies to follow certain policies and practices inhibits the aroma chemical market growth. For example, wastewater discharged at the time of producing various synthetic aroma chemicals incorporate some biotic oxygen compound. Under Clean Air Act and Toxic Substances Control Act, the regulations have imposed several restrictions on the release of VOC. With this reason, the production of aroma chemicals is predicted to happen at a slow pace in the upcoming years. 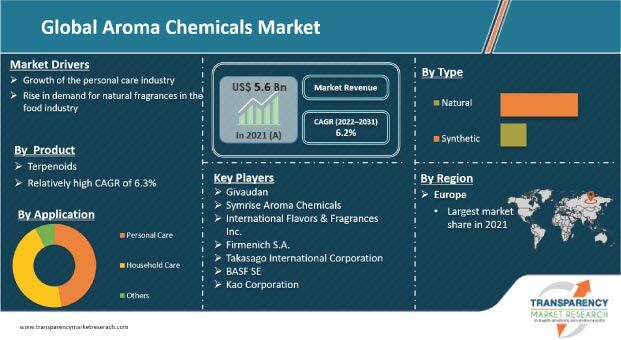 However, with the rising investments in product development and growing market penetration, is estimated to support aroma chemicals market overcome the challenges in the next few years.